Island innovators, local businesses, working groups, and energy experts have examined our renewable energy options and started exploring the technologies that could make self-sufficiency a reality. Here are a few of the renewable energy initiatives you can see on-Island today. There are many renewable energy projects on Haida Gwaii. Click on an icon in the map below to see more information about these projects. In her efforts to become energy-independent, in 2006 Meredith Adams made a choice to install an off-grid hybrid 1KW wind/solar power system with battery storage to generate electricity for her three cabins and workshop. The system meets current demands, including household lights, small appliances, water pump, and frequently operates a 13” planer and other tools. Meredith heats her home with wood and has a hot-water-on-demand system powered by propane. A back up generator is necessary from mid-October to mid-February, but her fuel bill is only $320 per year. Excluding the cost of labour to install and maintain the system, Meredith figures it took five years to pay off based on BC Hydro's residential rate for Haida Gwaii. The next steps for her include a solar pump for rainwater filtration. The success of Meredith’s investment led to the creation of her thriving business in 2007, Spark! Sustainable Energy Solutions. She is the only local renewable energy provider on Island. Laird Bateham and his family are faithful stewards of the environment, they live simply and operate an organic farm on Maude Island. Their off-grid lifestyle required innovation to produce energy for their home and business. To generate electricity for the majority of the year, Mr. Bateham installed a 10 kW run-of-the-river micro-hydropower system on Maude Island. The system does not require large storage reservoirs, although it is turned off in the summer due to low stream flow. The system has generated 112.5 MW hours of power since installation and offsets 60 kW hours per day. Maude Island Farms is looking for affordable options to generate power and save water in the summer months for irrigation. They are considering passive solar hot water and have added electric heat so they can continue to live and operate their farm entirely off-grid. Dorothy & Mike Garrett are known for their cozy accommodations in the Village of Queen Charlotte. With their commitment to the community through their business and the local SPCA, it is no surprise they’re also devoted to the environment. For 10 years, an evacuated tube solar collector positioned on the Guest House roof has converted sunlight into usable heat. Energy from the sun is used to preheat the hot water for their domestic hot water and boiler system. Reducing their dependency on hydroelectric power and oil has been both eco-friendly and cost-effective – the system paid itself off within six years. They’ve further reduced their energy consumption through investments into a hot water heating system, purchasing energy star appliances, and installing low-flow showerheads and low-flush toilets. Dorothy and Mike are now looking to upgrade the solar-hot-water system to increase its efficiency. Currently one of the largest solar installations on Haida Gwaii, the GidGalang Kuuyas Naay Secondary (formerly the Queen Charlotte Secondary) has 84 solar panels. Installed in the spring of 2016, the 24 kW solar array has been offsetting some 20% of the school’s electricity. The lifespan for solar installations like this is approximately 30 years, and these panels are expected to pay themselves off within six years. The maintenance supervisor, Steve Goffic, who initiated the project did so because it is one way that the school can reduce its impacts on the planet. “We have obligations to the province to lower our carbon footprint. We can be as creative as we want with that responsibility.” Mr. Goffic aims to have another 80+ panels installed by 2020. Visit the school’s website to view solar productivity of this array. Sk’aadgaa Naay Elementary school in Skidegate has an installation of 24 solar panels. These panels were put up out of necessity because of the sump pumps that must be running at all times. Because the Islands experience frequent power bumps, the maintenance supervisor, Steve Goffic, had to find a solution and so he turned to solar. “Every school within the district has to pay into a carbon tax fund based on our carbon footprint, we pay based on the carbon we use in the year. If you have a good enough project, you can get some of the money back.” Not only does solar provide the electricity necessary to run the sump pumps at the elementary school, according to Mr. Goffic, it was cost effective and is low maintenance. In 2013, Spark! Sustainable Energy Solutions installed two photovoltaics solar panels at the Village of Queen Charlotte's municipal office. The solar panels located near the building feed directly into the Village Office and help to offset their daily electricity use. On dark and cloudy days, the system produces very little electricity, but on bright and sunny days, the panels can help offset some of the office’s needs. In March 2015, for example, the solar panels produced a total of 230 kWh of electricity. On average, the 12 panels produce around 300 kWh per month in the summer. Paul and Debra Powers have lived in Masset for over 20 years. In 2010, Paul had an opportunity to invest in 14 solar panels at wholesale cost, and so he went for it. With experience working for an electrical company in Vancouver, he was able to install the array himself. After a few successful years producing solar energy, the Powers decided to increase their solar production. Today, the house has a total of 47 panels (8.2 kW) located on the house, garage, greenhouse, and one on their camper. The installation will take 15+ years to pay itself off, but they produce about 30% of the house’s annual electricity and the Powers are saving about $700 per year on their hydro bill. Along with the solar installation, Debra and Paul use LED lights in their home and have helped to offset their heating costs by installing a wall-mounted, ceramic heat panel. This winter, they are also planning to install an air-source heat pump that will further reduce their reliance on oil and diesel. Wind power is well developed and used around the world today. Turbines vary in design and size, and small-scale wind projects can operate with low environmental impacts. Reliability of wind energy varies by season so a secondary energy source is required, and wind turbines need maintenance, such as greasing and regular safety inspections. Solar panels are a tried and tested product that convert sunlight into electricity. As the technology develops, it’s becoming more affordable and one of the most widely used renewable energy sources worldwide. Even with the temperate climate on Haida Gwaii, solar is a great option with little to no environmental impacts. Geothermal power is a renewable energy that utilizes the hot water or steam beneath the earth’s surface. In areas of volcanic activity, the earth’s molten core naturally travels outward towards the planet’s cooler surface. Residential and commercial buildings can be heated and cooled by installation heat pump systems that utilize low temperature geothermal sources. Compared to fossil fuel sources, this is considered to be environmentally sustainable and has economic advantages with great potential in this part of the planet. Tidal power is energy generated from the force in the ocean tidal currents and height differences between tides. Movement as the ocean rises and falls create tidal streams in the ocean water column. Power from tidal currents is strongest where the water is accelerated around narrows, shoals, or headlands. Although tidal energy is still considered a new technology, Haida Gwaii could be an ideal place to harness electricity from the power of the sea. A local, privately owned company was founded in 2010 with a vision of creating clean, economical, and reliable energy from tidal power here on Haida Gwaii. See YourBrookEnergy.com for more information, or watch the video below. Small hydroelectricity units are a well-developed technology usually located on steep creeks. The amount of energy produced varies by season, so it requires a backup energy source. Compared to other renewable options, small hydro projects can have low environmental impacts but they have to be sited correctly. Sites must consider: impacts to fisheries, accessibility, and location to the distribution system. Wind power is well developed and used around the world today. Turbines vary in design and size, and small-scale wind projects can operate with low environmental impacts. Like hydroelectric, reliability of wind energy varies by season so a secondary energy source is required, and wind turbines need maintenance, such as greasing and regular safety inspections. 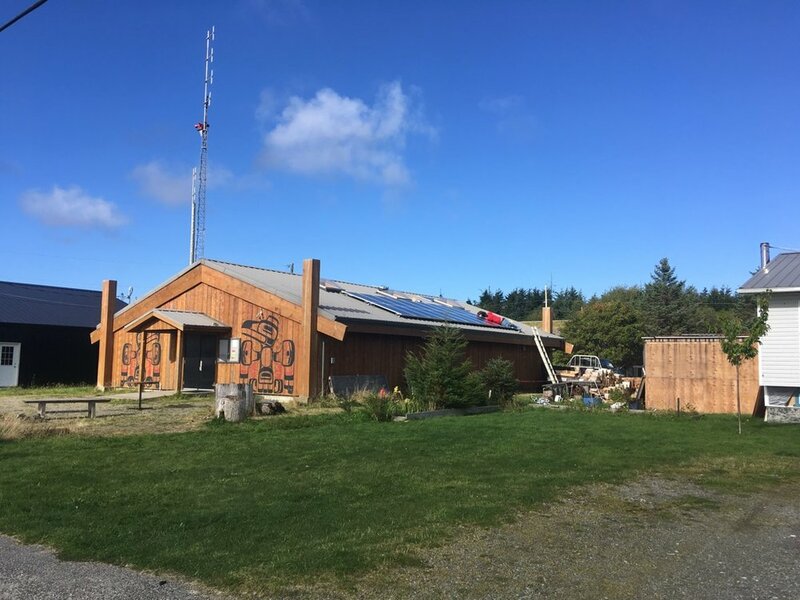 Seeing a need to save money and decrease the community’s reliance on diesel, the Skidegate Band Council (SBC) has been working to making local homes more energy efficient. The Band Council is committed to introducing small-scale renewable energy projects in the village. 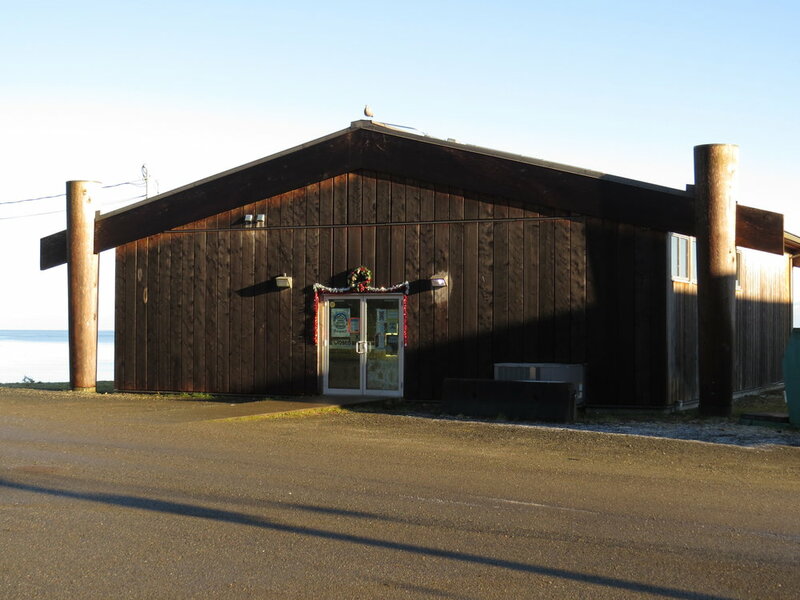 In 2012, SBC had solar hot water installed in two homes and one commercial building in Skidegate. In 2015 - 2016, FUJITSU heat pumps were installed in 350 homes in the village. As many Islanders will have noticed, a 50 kW photovoltaic solar panel system has also been installed on the roof of the George Brown Recreation Centre, a joint venture between SBC and the Island municipalities. Soon, the rec center will also have heat pumps installed to further offset the building’s electricity needs. SBC is installing heat pumps on all band-owned buildings, including the community hall, Daycare and rental apartments, fire hall, Ngystle office, Nursery school, and water treatment plant. SBC is now in final negotiations with BC Hydro’s Energy Conservation Assistance Program for insulation upgrades, sealing and draft proofing of residences, and energy monitors for homes in Skidegate. They are also in the final stages of confirming funding to put solar panels on the south-facing roofs at the Haida Heritage Centre. The SBC is devoted to forming partnerships to fund and improve the presence of renewable energy in their community. Norman McGregor moved from Calgary to Sandspit in 2013. Once settled on Haida Gwaii, he installed a 1.4kW solar array with battery and back-up system, and in 2015, he installed a 400w wind turbine. That, along with a woodstove helps this household keep energy costs extremely low over the course of the year. In total, up to 75% compared to previous years, and the added bonus: He have power during the Islands’ frequent power outages. Seeing great success with the solar installation, Norman recently added an additional eight solar panels bringing the household installation up to 3kW! The message he would like to share: Solar and wind power work on Haida Gwaii! Want to see this exciting off-grid house? Check out Norman's YouTube Channel. Creating spaces for youth to see and experience solar energy was an important vision that came to life through a partnership between the Hiit'aGan.iina Kuuyas Naay and Swiilawiid. In November 2017, this 5.3kW solar array came online. With stunning ocean views from a traditionally structured Haida building, this array is expected to produce a significant portion of the youth center’s energy needs. Watch real time data on solar production at Hiit'aGan.iina Kuuyas Naay! Creating spaces for youth to see and experience solar energy was an important vision that came to life through a partnership between the Old Massett Youth Center and Swiilawiid. In November 2017, this 5.3kW solar array came online. With beautiful skylights and energy efficient air source heat pumps in the Old Massett Youth Center, this array is expected to produce a significant portion of the building’s energy needs. Watch real time data on solar production at the OMYC!